Limitation of the total account loss. When the MinimalDepo value is reached, any trade will be closed. Limitation of losses per day. Limitation of losses in each trade. If a trade is accidentally opened with a large volume, the excessive volume is closed. Set the maximum number of trades opened at a time. Set the number of consecutive unprofitable trades. Set the maximum allowable number of trades per day. Send notifications to Email or MetaQuotesID. MinimalDepo – in the account currency. 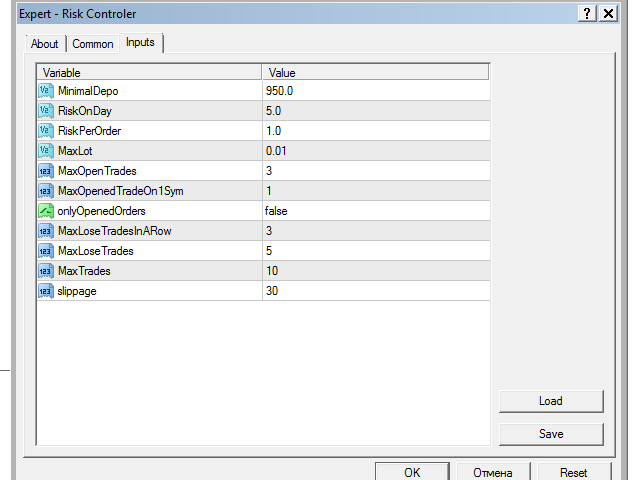 If the balance falls below this value, trading is blocked completely until the balance or this parameter changes. RiskOnDay – in the account currency. Calculated relative to the account balance at 00:00 (broker time). RiskPerOrder - in the account currency. Risk per trade. MaxLot – volume. When a trade is opened with a larger volume, partial closing occurs. MaxOpenTrades – the maximum number of trades opened at a time. MaxOpenedTradeOn1Sym – the maximum number of trades opened on one instrument at a time. OnlyOpenedOrders – if true, only opened trades are considered and pending orders are ignored. MaxLoseTradeInARow – the number of consecutive unprofitable trades per day. MaxLoseTrades – the number of unprofitable trades per day. MaxTrades - the maximum number of trades per day. Slippage – slippage when closing a trade by market. TypeAlert - type of notifications. When closing a trade, Risk Controller logs the reason for closing and the ticket. The main parameter is specified as the reason for closing. For example: "Current balance is lower than Minimal Depo. Reason - MinimalDepo." Please note: if several conditions are fulfilled simultaneously, the closing and notification will be performed according to the parameter with the highest priority. A parameter check can be disabled by setting a zero value. If the settings are incorrect, all trades are closed, both current and new ones. 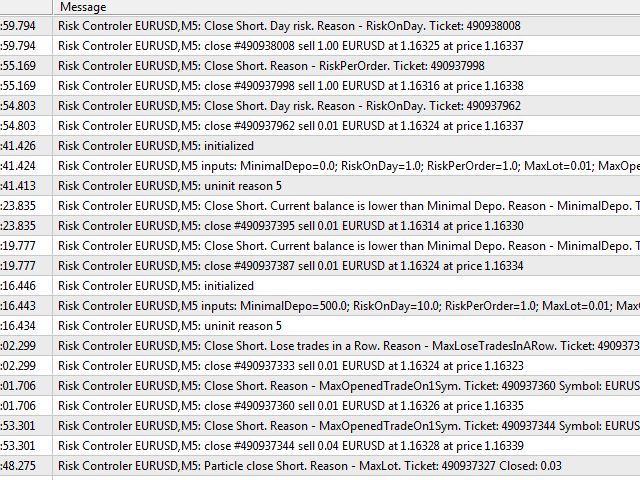 Example of the robot operation: Balance = $952, MinimalDepo = $950 and RiskOnDay = $5. After a loss of $2, the balance will be equal to $950. Despite the face that RiskOnDay of $5 has not been reached yet, MinimalDepo has a higher priority. Open orders will be closed, pending orders will be deleted, new orders will be closed due to the reached MinimalDepo. Risk Controller can work 24/7 If this important for you, rent VPS-server!